Join us for our swing-ing-est fundraiser of the year! The Eight to the Bar Speakeasy at Eastern Market's North Hall features amazing food from Old Blue BBQ; craft beverages with cocktails and EENAABs [equally-enticing non-alcoholic adult beverages], beer from 3 Stars Brewing, and wine hand-picked by The Pursuit Wine Bar; a silent auction featuring local get-a-ways, cool experiences, art, food, and more; and hot jazz by the Blue Crescent Syncopators! 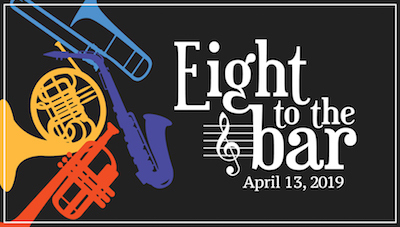 Eight to the Bar is our biggest fundraiser of the year. Besides having an amazing evening, you will be supporting our continuing efforts to bring high-quality musical performances to DC and beyond. Tickets are available at multiple levels. Bring your dance partner and save! Premium Ticket $75 Includes open bar for the entire evening, early admission (7pm) with extra food options, a gift bag, a cdiscount on next season's tickets and other perks. These tickets will NOT be sold at the door - advance sales ONLY until Friday at Midnight! Basic Plus Ticket $65 Includes early admission at 7pm, food, and 3 drink tickets. Basic Plus Ticket for Two $117 Includes early admission at 7pm , food, and 3 drink tickets per person. Basic Admission $30 Includes admission at 8pm and food. Drink tickets must be purchased separately. Basic Admission for Two $50 Includes admission at 8pm and food. Drink tickets must be purchased separately. We have a very cool selection of experiences, getaways, and hand-crafted items in this year's silent auction. These include Nats tickets, theatre subscriptions, limited edition letterpress prints, one-of-a-kind jewelry, Caps Stanley Cup memorabilia, and more. Preview the items up for bid.